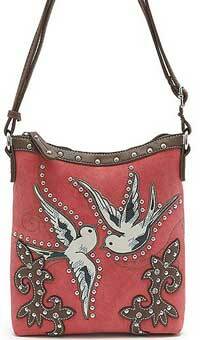 The Western Design Birds Accent Bag is made of faux leather in a soft poppy color. There are two birds on the front with decorative silver colored studs. On the back of this bag is a 7" zippered pocket along with a covered slash pocket. 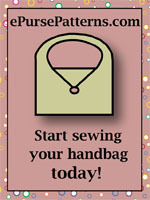 Inside is lined with designer fabric and there is an additional zippered pocket. 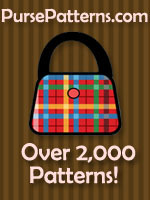 The top closes securely with a zipper and there is an adjustable shoulder/cross body strap. Measurements are 9.5" Long x 10" H x 1.5" Deep.